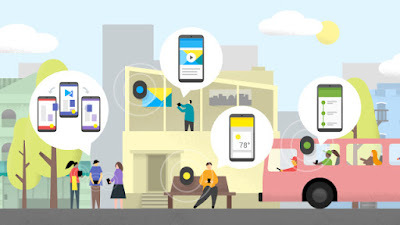 Beacons in Retail: Will Eddystone Be a Game Changer? Departments, Aisles and Product Sections feature beacons that help users locate the product they're looking for and alert them if it's in stock. If it's out of stock, users could be pushed to complete a transaction through the mobile app or eCommerce site to order for home delivery. App users could instantly connect to an expert through chat or messaging to ask product questions or get help with an order. Product Sections feature beacons that trigger access to exclusive content from content creators, product reviews, and lifehacks featuring the products. For example, a shopper in the Home and Bath section of a store may receive a video of interior design inspirations with complementary products that are curated by a popular YouTuber, or featured Pinterest boards from a Pinfluencer. Shoppers can leave reviews, tips and complementary product suggestions through an app experience that are tied to physical locations in stores. For example, a shopper may have had a better experience with a particular brand of cleaning materials -- they could leave that preference in the form of a social sticky note for the next shopper to discover.